Smoky succulent shrimp rolled in spices that caramelize; placed over a crispy potato nest then drizzled in a buttery béarnaise sauce hit on all of your taste buds…. 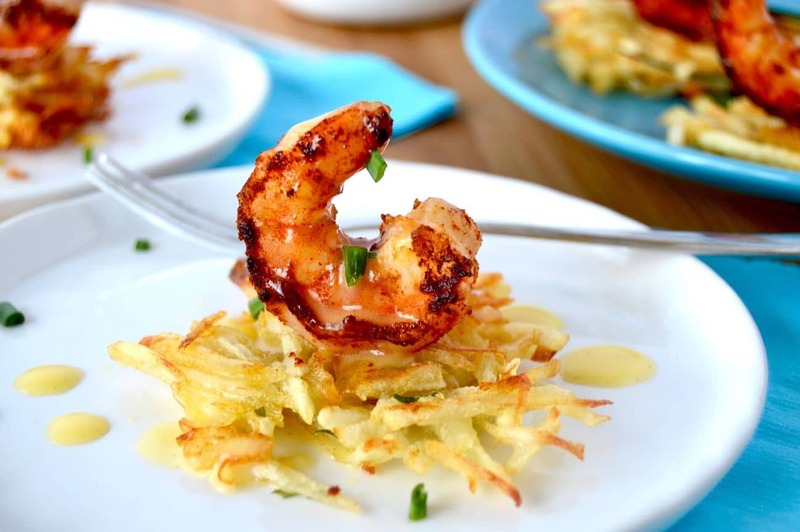 This recipe for Smoky Shrimp on potato nests is a fantastic appetizer that looks great and tastes even better. Smoky shrimp on Potato Nests are my new favorite appetizer. We’re trying to eat more fish and and eat smaller portions. 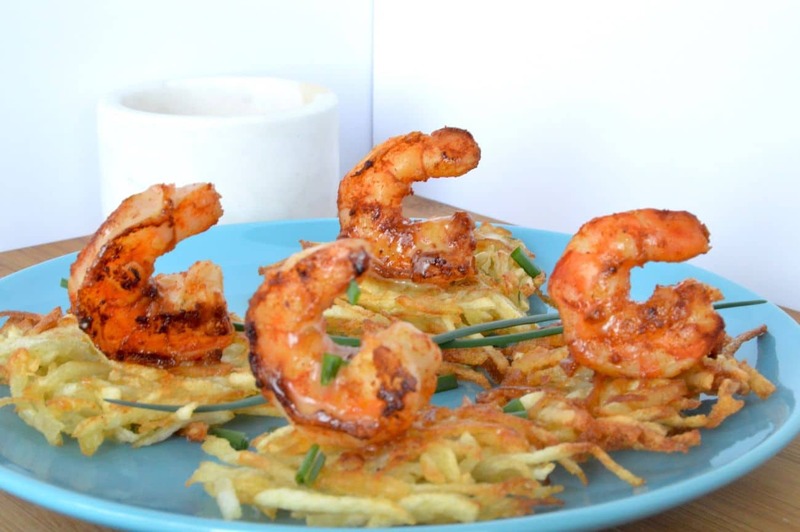 There is a potato nest along with these yummy smoky shrimp, but the highlight is the shrimp which is packed full of flavor. The spices for this recipe came from the pulled pork recipe I shared a while back. When you make the pulled pork, there is always some spice rub left and since we knew how good it tasted on pork I wanted to try it on this shrimp. What is the secret ingredient that gives the Smoky Shrimp on Potato nests it’s caramelized texture? You’ll find that the spice rub caramelizes when you are cooking it, and gives a deep smoky taste that also provides a little crunch on the cooked shrimp. It’s the small amount of brown sugar that is the secret ingredient in the spice rub that gives you this. The heat melts the sugar and it crystalizes on the edges of the shrimp. While the shrimp would be fine on their own I wanted something a little more for the appetizer presentation. Hello potato nests! Who doesn’t love crispy potatoes? By using these as one or two bite appetizers you can use just a small amount of potatoes for each serving. It might be a small bite, but it adds so much to the overall presentation of the dish. Lastly, to tie this together you can drizzle a buttery smooth béarnaise sauce with just a hint of cayenne and lemon to tie the bite together. 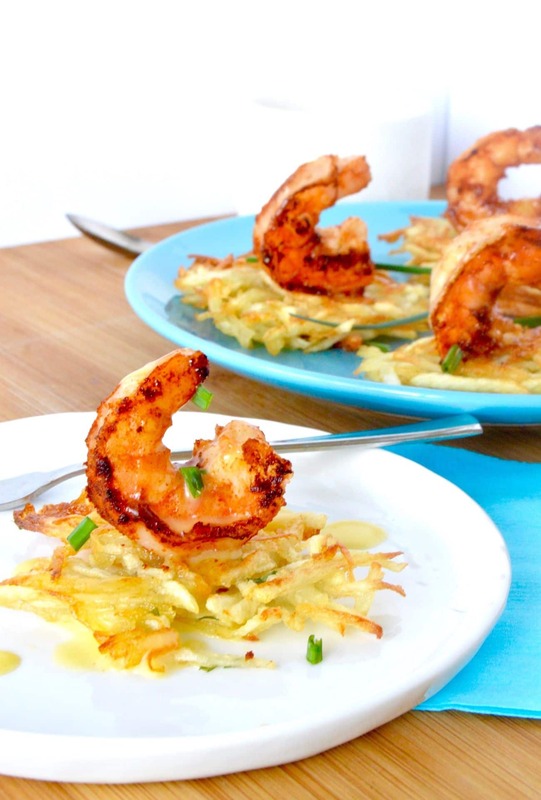 This Smoky Shrimp on potato nest recipe needs to be made when you’re ready to serve it. I find it works best for smaller gatherings only because people LOVE them and if it’s for a big group of people you wont be able to keep up with the demand. These work well with a Prosecco or a Riesling because they pair nicely with the smoky shrimp. Smoky succulent shrimp rolled in spices that caramelize placed over a crispy potato nest then drizzled in a buttery béarnaise sauce hit on all of your taste buds…. This recipe for Smoky Shrimp on potato nests is a fantastic appetizer that looks great and tastes even better. Mix all ingredients for Dry Rub to combine evenly. Measure out 1/3 cup to use for this recipe save the rest for another time. You can use this rub in other recipes, such as pork and chicken. Toss Peeled and deveined shrimp in 1/3 cup spice mix and set aside. Peel the potatoes, then shred them. Squeeze out any liquid and set aside. In a small skillet add the oil and heat to high. 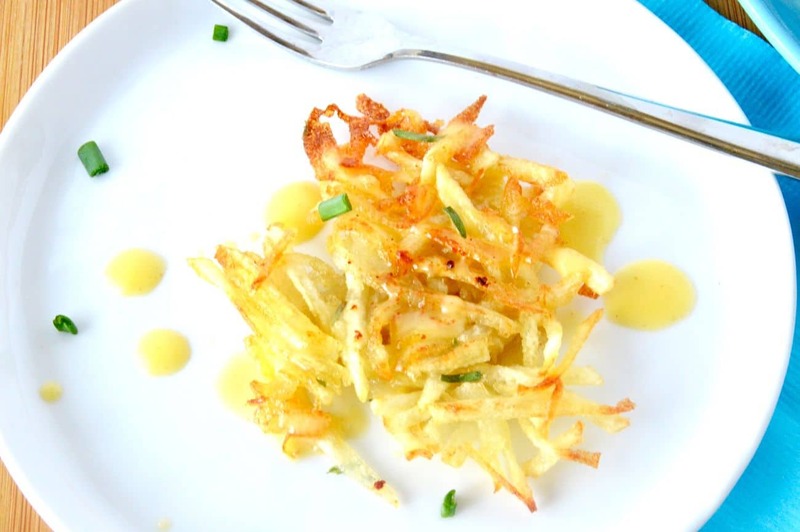 Once oil is hot, drop about 2 tablespoons of shredded potatoes into small 2" flat rounds. Spread potatoes to an even thickness for even cooking. Leave plenty of room in between so nests are easy to flip. Reduce heat to medium high. Cook for 2-4 minutes on one side until golden brown, then flip gently by turning away from you so if any oil splashes it splashes away from you. Finish cooking for an additional 2-4 minutes, until golden brown. Potatoes will be crispy on the outside with a more soft inside. Season potato nests with the seasoned salt. Cook in batches until all potatoes are finished. Remove from oil, allow to drain on a paper towel. You can keep the potatoes warm in an oven at 250° while you cook the shrimp. At this point make the béarnaise sauce as listed in the recipe below. Heat a small skillet to high, take 2 tablespoons of oil from the skillet that you cooked the potatoes in and place in hot pan. Then add shrimp in batches cooking until shrimp is cooked through. Approximately 2-3 minutes per side. Remove from pan for assembly. On a serving plate place potato nest, top with the one shrimp per nest. Once all nests are topped, drizzle béarnaise sauce over the top. Season with salt and pepper and serve immediately! This recipe works great for chicken, fish or any meat. It also works well with eggs! Heat a pan of water that has an opening that is smaller than the bowl you have the egg yolks are in. Your egg yolks will now be slightly thickened. Melt butter in microwave and then very very slowly add butter one small drop at a time while continuously whisking the egg yolks. The egg yolks and butter will slowly thicken. If you pour the butter in too quickly the béarnaise will not thicken, it will remain very thin. Once all butter is incorporated add cayenne and lemon juice, mix well and set aside until use. 8	You need to make this very close to the time that you will be serving it, it tends to get gummy if you don't. These are so elegant and pretty. My dad would love these one night, I’m passing this recipe to my mom. Yum – these would be great for my Easter party! What a beautiful little appetizer! I’d even go so far as to make a large potato nest with a bunch of shrimp on top and call it a meal! I love shrimp and I love potatoes nests. I always see so many food posts that I have to modify due to food allergies. This is exciting though b/c this can recreated! It looks delicious and shrimp is such an easy and fun alternative to meat! I love this so much and LOVE the potato nests!! We absolutely love shrimp, and this recipe is delicious sounding! My hubby would probably use Old Bay instead of Lawry’s (which is what I’d use). These would make a great appetizer for our Easter get together. My hubby would love this! We’ll have to try it for sure. Thanks so much! Yummy!! I love shrimp and I would love to make this for one of my blogging parties. Yum! That looks amazing! I love shrimp, but haven’t made it in ages, I think I might have to get some this weekend! What a creative recipe! YUM. I love shrimp and béarnaise sauce, and this recipe definitely a winner for me. The presentation just making me craving for something now. I’ve never had shrimp prepared this way and it looks yummy. This would be a great appetizer or finger food to serve at a party. Will have to save this recipe. This potato nest sounds really good. I’ve never had that before! This sounds amazing! I love a little bit of spice and these sound like they have the perfect amount of heat. Adding to my menu! I thought opening this up to read first thing this morning would deter me from wanting to eat it all….not the case! I would totally put down my coffee and gobble up these delicious looking shrimp and potato baskets! They look phenomenal! I don’t even like shrimp (Yes, I know I’m weird! lol) but the way you described that rub has my tummy rumbling! My husband would love this and it is a beautiful presentation! What a unique appetizer recipe! Also a great spice mix to use on shrimp for an entrée. I dont eat sugar but I bet I could try honey. Thank you! Oh man, now I’m hungry. I love shrimp and anything potato. This looks like an impressive and delicious appetizer. 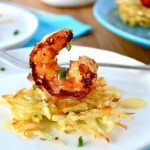 The potato nests look delicious, what would you include instead of shrimps as I am a vegetarian? I have never tried a potato nest before! This recipe looks delicious and easy to make. I may even turn it into a bowl recipe in order to have it for dinner. Oh, these are cute and perfect for parties! I always hate serving things that appear cheap. I like people to know I put a but of effort in. These would do the trick! I love shrimp and I love potatoes nests. YUMMMMMM. Those look so good. I am not a fan of shrimp though. I bet my husband would LOVE these. He has been on a major shrimp kick as of late. Mmm I’m loving the sound of this! They’re so pretty too! wow Michelle!! This is simply stunning.. have never tried shrimps and potatoes but Im so tempted! !